Members of the Airman Leadership School Class 17-B pose together for a class photo prior to their graduation ceremony Feb. 16 at Nellis Air Force Base, Nev. Eighty Airmen completed their first Professional Military Education milestone by graduating this course. NELLIS AIR FORCE BASE, Nev. — Eighty Airmen completed their first Professional Military Education milestone by graduating Airman Leadership School as part of Class 17-B February 16, 2017, at Nellis Air Force Base, Nevada. Ten members of the class were recognized with individual awards. Senior Airman Nicole Seaman, a member of the 22nd Attack Squadron, received the John L. Levitow Award. This award is the highest award presented at all levels of enlisted PME and is given to the top graduate in the class. The recipient of this award has not only excelled academically, but also exemplifies the highest standards of a professional military member. Senior Airman Ashley Boyette, a member of the 926th Force Support Squadron, received the Academic Achievement Award. This award is presented to the student who has demonstrated dedication to the core value of “Excellence in All We Do” and has achieved the highest overall academic score. Senior Airman Bradley Neier, a member of the 757th Aircraft Maintenance Squadron, received the Commandant Award. This award is presented to the student who consistently displays exemplary military professionalism and promotes teamwork. 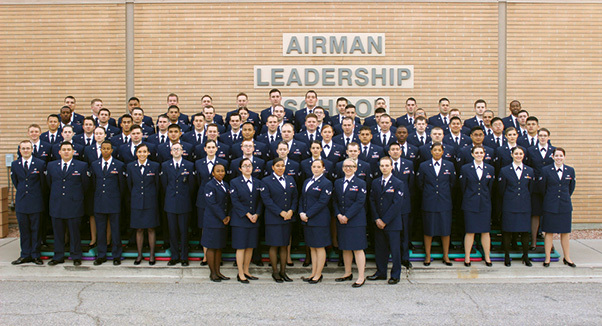 The following Airmen were the distinguished graduates of the class. These students were outstanding in objective and performance evaluations, demonstrated leadership, had superior performances as team players and finished in the top 10 percent of the class. Below are the names of the Class 17-B graduates and their flight instructors.